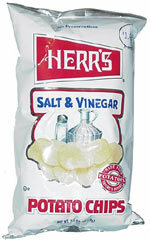 Taste test: These are good vinegar chips. The vinegariness varies from chip to chip, with some just somewhat vinegary and others very vinegary. It’s hard to stop eating them.